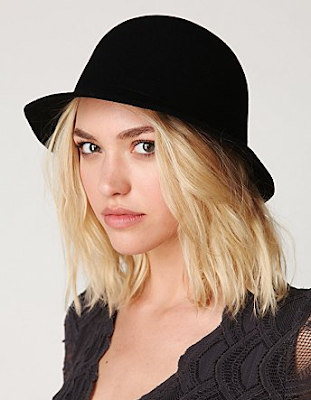 I adore hats, but never realy got into the boho floppy brim hat trend that's been prevalent the past few months. But if I hadn't just bought a wide brim Indiana Jones style hat, I would immediately be snatching up this fab piece, which is like the love child of a cloche and bowler hat! Buy at Free People before it sells out for $78. That hat is super cute! Want.